The replacement heater blower motor is no longer available as a complete assembly; only the blower motor itself. Many of us would like to keep the original metal or aluminum fan blade, but it’s almost impossible to remove the fan blade from the old/seized motor without destroying the pressed in plastic bushing that the fan sits between. By this decade, any of these bushings have also become brittle and separated. If you have a very early metal blade that came with the set screw, then you may be able to transfer and reuse the blade if the set screw is not rusted out. PRDesignSF has been proud to offer you the plastic fan blade that adapts to the new motor. Since there is a lot less weight for the motor to turn, it puts less stress on the motor, allowing it to last longer while providing almost the same air flow. For those who would like to save and reuse the metal/aluminum blades, we have created an adapter screw from stainless steel that will work. Now you will be able to reuse the metal blade and make it look more original. Heres’s a quick guide to removing the blade safely without destroying it. The one thing that you do not want to do is attempt to yank the blade off the shaft; you will damage the blade. The metal shaft needs to be cut off and press out. You could reuse the plastic bushing if they are still in good condition, or if you do not want to take a chance for the bushing become separated in the future, you can use the new adapter screw that we made. With the motor out, separate the plastic body housing by prying the tabs and they will split up. Remove the press-in clip at the end of the shaft and cut the upper support arm bearing housing. This is to create some space for you to be able to cut the shaft. Now you can pull the internal parts out, including the stator, from the housing. 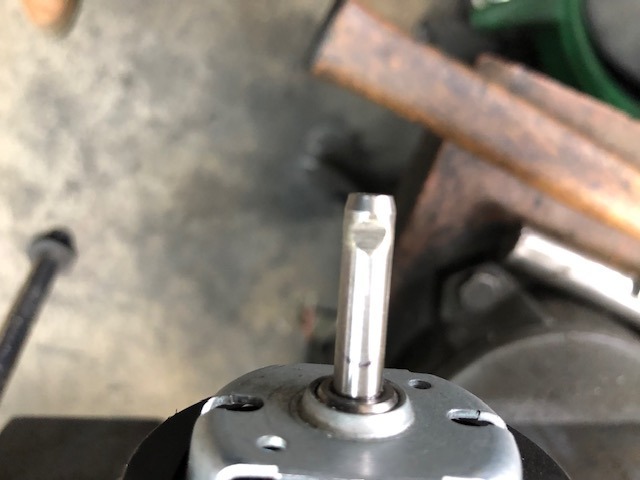 There is a square clip at the back of the bearing support arms; pry it with a screwdriver and the support arm will become loose, but still attached to the shaft. It’s seated in a spherical race. You should be able to move it around to create enough space to cut the shaft now. With the shaft cut off, turn the fan upside down and support it with a 14mm deep socket. Now, you can use a punch to drift the shaft out. The bushing will be separated and the fan will be free. 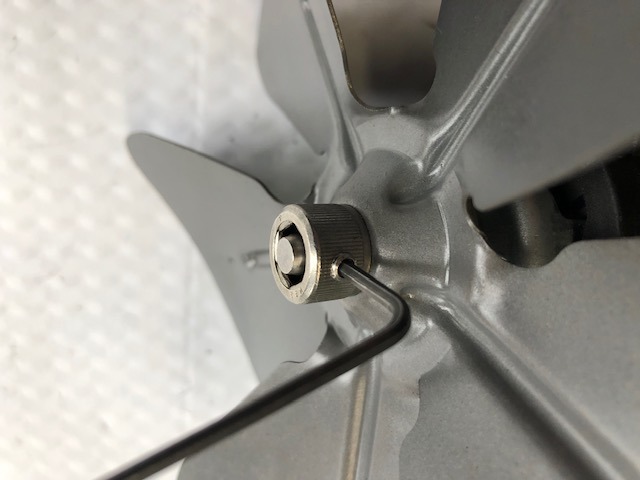 The plastic bushing consists of two separate parts, the top half features a built in key to lock the blade, and the bottom half to keep the the upper bushing from coming off the blade by pressing into it. You can clean up the blade, but be very gentle with an aluminum blade: It’s very easy to deform the blade. The adapter screw is very easy to install. Twist the adapter through the fan center hole and tighten it with the nylock nut. Use an 8mm allen and 14mm socket to tighten the adapter screw. Tightened to 16-18 Ft Lb. Mark approximately 5 mm from the upper fan body to the shaft; too far out and the fan will interfere with the fresh air flap. You can also tell if you’ve put the fan at the right depth if you have the chamfered edge slightly sticking out from the adapter. Tighten the set screw using a 2mm allen into the shaft. Because the set screw is cupped, it will bite into the shaft and secure it. Be sure to use thread locker (medium strength) on the set screw to prevent it from backing out. You could also apply a dab of paint on the top of the set screw to provide additional protection from backing out. Optionally (Recommended), you can also cut a divot into the shaft to provide a flat area for the set screw to sit in; it’s still a good idea to apply threadlocker onto the set screw. To test proper blade orientation, power up the motor (Male -, Female +). When the blades are facing you, they should be turning counter clockwise. If you feel a lot of vibration (Light vibration is acceptable), then most likely the blades were not straight. Looking from the side of the motor, check if all the blade’s center ridges are 90 degrees (perpendicular) to the shaft motor, otherwise they are out of balance. With this, now you have the option of reusing your metal/aluminum blade or plastic blade. Either metal (Used) or plastic fan blades can be purchased from our store as well. Contact us at www.PRDesignsf.com or email support@prdesignsf.com. Happy ’02 motoring!